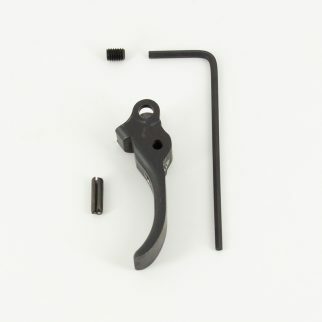 CGW’s new CZ P-10 C short reset trigger. Drops in and produces a reduction in pre-travel. Deep inside the trigger we have installed a 3 mm x 6 mm pre-travel screw for those that want to custom tune their trigger for the ultimate in trigger control. The trigger is curved to position the trigger finger in the center of the trigger, resulting in a more consistent trigger pull. This curve also helps keep the trigger finger away from the bottom tip of the trigger. Made from billet aluminum. 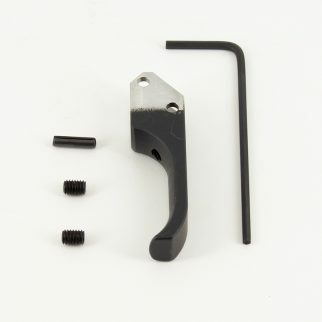 This trigger is longer than the stock CZ P-10 C plastic trigger, and has been extended as close to the bottom of the trigger guard as reliably possible. 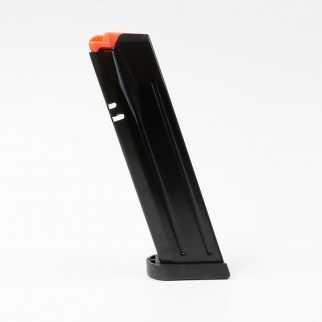 This longer trigger, combined with the curve, virtually eliminates trigger “sting” or “bite”. The center pivot is flush with the trigger face during use, resulting in a comfortable “all day” trigger.